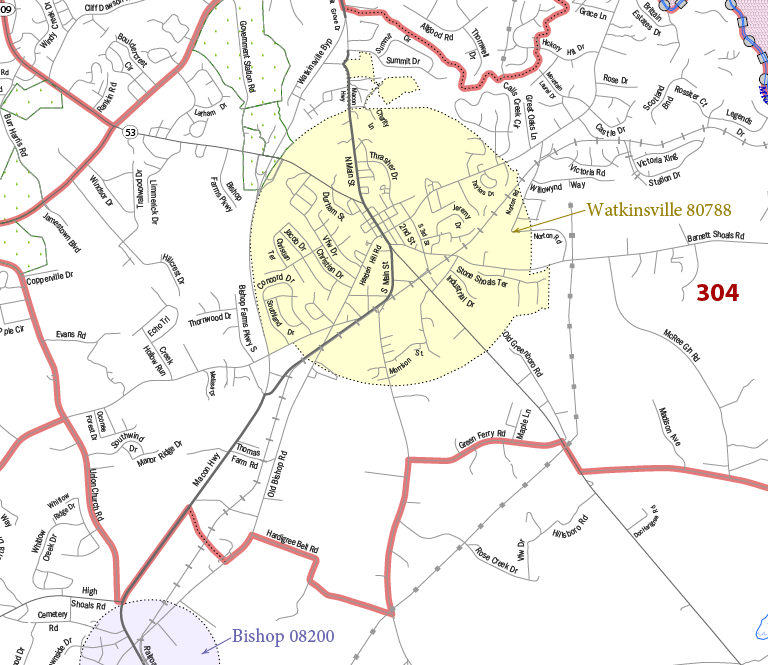 People outside Oconee County--and maybe even some of those inside--might be forgiven for thinking Watkinsville is a bigger place than the circle with a one-mile radius that sits slightly off center in the county and is home to 2,832 residents. The Athens Banner-Herald yesterday had a story from Oconee Veterans Park, which is three plus miles outside the city border of Watkinsville on Hog Mountain Road. As is typical for the paper, it used a dateline of Watkinsville for the story. Dominicks, Taqueria La Parrilla and Your Pie restaurants in Market Center shopping center west of Butler’s Crossing, more than a mile from the city border, all list Watkinsville as their address. The same is true for the many shops in Butler’s Crossing itself, which is outside Watkinsville. And St. Philothea Greek Orthodox at 3761 Mars Hill Road, almost at U.S. 78 and more than six miles from the Watkinsville city border, also has a Watkinsville address. The Watkinsville Post Office delivers mail to much of Oconee County, leaving many people and businesses to correctly associate themselves with Watkinsville. Come Nov. 8, however, only the 1,876 registered voters in Watkinsville proper, plus any other city residents who register before the deadline on Oct. 11, will get to decide who will be the next mayor of Oconee County’s largest and oldest city. As the county seat and the historic center of the county, Watkinsville certainly has more impact on Oconee County than its size, both in terms of space and residents, would seem to warrant. And that makes the mayoral election on November 8 of interest to many residents, myself included, who won't get to vote in it. The race is nonpartisan, with Charles Ivie and Dan Matthews competing for the spot. The mayor serves a two-year term. Ivie is district manager for Baldwin Filters. 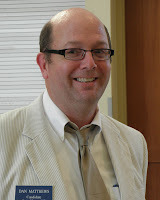 Matthews is a legal secretary, law clerk and paralegal at the law offices of Eric K. Krasle and Associates in Athens. 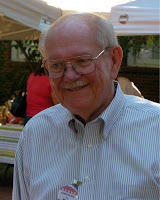 Matthews ran as a Democratic candidate in the special election on June 21 to fill the vacant Georgia House of Representatives District 113 seat. He came in second in that four-way race and lost in the July 19 runoff to Chuck Williams, who ran as a Republican. Watkinsville voters fall into two of the 13 precincts in Oconee County. They make up 75.5 percent of the 1,535 voters registered as of Sept. 1 in the City Hall Precinct, and 36.0 percent of the 1,990 voters registered in the Annex Precinct, according to data given me last week by Pat Hayes, county election director. In the June 21 balloting, Matthews got 57 of the 209 votes cast in the City Hall Precinct, or 27.3 percent of the vote. In the July 19 runoff, he got 105 of the 260 votes cast in that precinct, or 40.4 percent. In both the June 21 and July 19 balloting, that was his strongest showing among the precincts in the county. In the June 21 election, Matthews got 55 votes of the 294 votes cast in the Annex Precinct, or 18.7 percent. In the July 19 runoff, Matthews got 116 of the 375 votes cast in the Annex precinct, or 30.9 percent. Matthews is a resident of Annex Precinct. One of the others candidates on the June 21 ballot, Alan Alexander, also lives in Watkinsville in the City Hall Precinct. Candidate Sarah Bell is in the Civic Center Precinct, and Williams is in Antioch Precinct. All four of the candidates have a Watkinsville mailing address. The mayoral race is the only contest on the ballot in Watkinsville in November. All Oconee County voters will be asked to decide to vote on renewal of the one percent Special Purpose Local Option Sales Tax for education. How many voters will go to the polls in Watkinsville or elsewhere is difficult to predict. Reflecting the interest of the Watkinsville race to the whole county, The Oconee Enterprise is sponsoring a candidate forum for the mayoral candidates at 7 p.m. Oct. 13 at the Oconee County Library on Experiment Station Road in Watkinsville. Watkinsville’s residents make up only 8.6 percent of the 32,808 people living in Oconee County, but the city is the largest of the four cities in the county. Bogart, according to the 2010 U.S. Census, had 1,034 residents, North High Shoals had 652, and Bishop had 224. 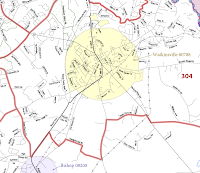 Watkinsville has been in existence with that name since at least 1791, only 58 years after the founding of the colony of Georgia. It is at the center of key parts of the county’s road network even today, with both SR 15 and US 441 crossing through it. It led the way in the county in the sale of beer and wine in restaurants. Those restaurants in Market Square exist today in large part because the county changed its beer and wine ordinances to compete with the emerging restaurant scene in Watkinsville. The cities in the county started getting a share of the Special Purpose Local Option Sales Tax collected in the county starting with the 2009 tax, and Watkinsville has used part of its money to beautify Harris Shoals Park, located inside Watkinsville but used by people throughout the county. Ivie indicated while campaigning at the Farmers Market in Watkinsville on Saturday that future use of SPLOST funds is something he will talk about in the campaign. It is likely to be a topic at the Oct. 13 candidate forum sponsored by the Enterprise. Thank you for the article. This is probably one of the most important political races Watkinsville has had in a long time. As owner of one of the historical buildings and businesses in Downtown Watkinsville, I like many other Watkinsville property owners can not cast a ballot in this election. I live just 2 miles from my business and have a Watkinsville mailing address but I am not within the boundries of Watkinsville. Watkinsville has seen some very drastic changes over the last 5 years. Due to "Streetscapes" on street parking was reduced by 50%, our double sidewalks were also reduced by 50%, and a 3rd south-bound turning lane from state hwy 15 onto a one-way side street was added forcing traffic closer than it has ever been to our historic buildings. Watkinsville needs a mayor who will listen to the issues facing the business district and actuall address them.